While ventilation needs in the letterpress shop can be minimized through the judicious use of solvents, some solvent use is unavoidable. To minimize exposure to yourself and your shop mates, proper ventilation is key. 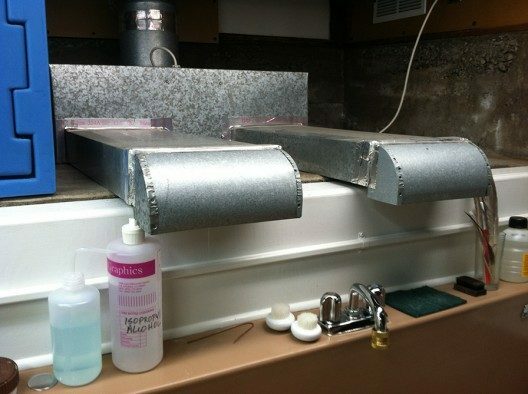 The first thing to remember when setting up a ventilation system is that pulling (sucking) air is far more effective than pushing (blowing) it. Setting a fan up to blow onto a form you’re cleaning only disburses the solvent fumes throughout the room, it doesn’t lessen them. On the other hand, pulling air though the shop from an open window, across the form, and exhausting it outside will truly lower the fume concentration in the room. The other advantage of pulling air is that it creates a laminar, or straight line flow, which is far more efficient at removing contaminants than pushing them away. Pushing creates turbulence which is far less effective at moving air. Bends and turns in the ductwork decrease efficiency. In many cities the exit vent needs to exhaust on your property, not the public right of way. Vents are inviting places for bugs and critters to nest—screening on the exterior end is advised. If possible, give the ductwork a slight slope to the outside. While there should be some sort of rainproof cowling on the terminal (outside) end, in the event of a storm, any water that blows under the cowling won’t run into the building. Use peel and stick aluminum foil tape to seal the ductwork joints. Cloth duct tape will fail. Consider setting up targeted, dedicated ventilation—for instance, pull air across and out of the area where you clean forms after they come off the press. Make sure there is an automated damper or louvers in the system to seal it when not in use. 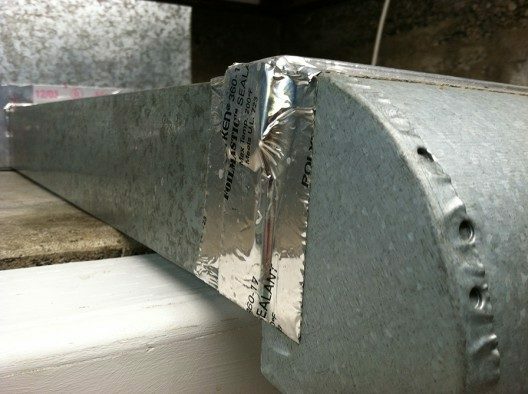 If you use an in-duct fan, be sure to allow for maintenance access. Placing the fan near the terminal end of the system will make for a quieter installation. While small shops probably won’t have any problems, if you’re working on ventilation for a large shop, hiring a professional is a good idea: there are issues around make up air and air flow that are beyond most shade-tree ventilation designers.